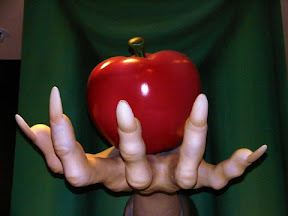 " you WILL eat this nice, red apple. Why`? Because ITS THE ONLY ONE YOU ARE ABLE TO GET !!!! AHHH ha ha, you fool ... "
A controversial new EU regulation that has threatened to outlaw thousands of mineral supplements and bankrupt health food stores across Britain was upheld this morning. The European Court of Justice approved the Food Supplements Directive even though the court's own Advocate-General advised that the Directive was invalid under EU law. The ruling - greeted with surprise - is a defeat for a concerted campaign by more than a million British health food customers and shops. They have argued that the law, which will come into effect on August 1, will impose an unprecedented level of regulation on mineral supplements and could threaten the existence of small suppliers. The Alliance For Natural Health (ANH), a group backed by the British Health Food Manufacturers’ Association, have contended that it is unfair for health food manufacturers to bear the cost of applying for approval for products they have been selling for many years. But the judges of the European Court of Justice said today that the new law was necessary to simplify the trade in natural remedies, and to give clear health advice to consumers by instituting an approved list of supplements, known as a "positive list". The court observed that "before the directive was adopted, food supplements were regulated by differing national rules liable to impede the free movement of those goods and the functioning of the internal market." But in an apparent concession to the British health food industry, which sells around £300 million of natural remedies every year, the judges did promise to simplify the application process for ingredients. They ruled that the burden of proof should shift from those seeking approval to those seeking to ban a product. The judges concluded: "An application to have a substance included on a list may be refused only on the basis of a full risk assessment, established on the basis of the most reliable scientific data available and the most recent results of international research. A refusal must also be open to challenge before the courts." The initial reaction of the British health food industry was mixed, as campaigners said they were still digesting the ruling and analysing the revisions made to the application process. "We had expected a better verdict," said a spokesman for the Alliance For Natural Health this morning. "On the surface it looks like bad news, because they are upholding the Food Supplements Directive and that is disappointing... However, there may be a positive side to this." Sue Croft, the director of Consumers for Health Choice, said that their campaign for special allowances for the British health food industry would go on. "I think that we still have to stick out for a national delegation," she told Times Online. "We have to re-open negotiations with the EU trade commission to keep hold of our supplements and keep the British market intact. I think we have the political will to do that and that would be brilliant." The Directive was first approved by EU governments in 2002, and health food manufacturers were given until today - July 12, 2005 - to submit detailed scientific dossiers proving their ingredients were safe. Those supplements that failed to qualify would be banned. Over the last three years, health food suppliers have either reformulated their goods, replacing natural substances with synthetic chemicals that already have EU approval, or waited as their legal challenge made its way through the courts. As part of their campaign, a petition of more than one million signatures and a letter of protest has been sent to Tony Blair signed by more than 300 doctors and scientists. Today's deadline means that health food retailers and manufacturers have sent in hundreds of dossiers for their ingredients over the last week, leaving the current list of which products are banned and which are approved in flux. "There is no current accurate list," said Ms Croft.